Powerful neoprene adhesive. 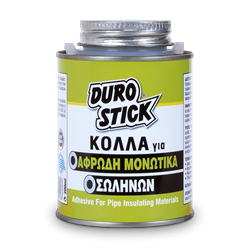 Suitable for bonding foam insulation pieces for pipes, when installed on existing piping systems exposed to frost, as well as metal or PVC piping for solar water heaters and garden pipes, metal or plastic, that are exposed to the elements. Durable against frost, moisture, high and low temperatures. The container cap has a built-in round brush for easy applications.